Choose a program that best fits your needs. Cigna Dental Savings is a discount dental program designed for you – for individuals, families and seniors looking to save money on their dental care needs. It’s not insurance; it is an affordable and easy-to-use alternative to dental insurance. The program gives you access to a large network of participating dentists that have agreed to offer their services at discounted rates averaging 31%* savings for you, without the hassles of claim forms, waiting periods or referrals for specialty dental care. You can choose from one of our three programs. Each program has a different affordable annual fee to join. In addition to the dental services discounts, each program offers a variety of valuable, everyday discounts. You select the one that best meets your needs so you and your family can start enjoying all the discounts that come with the program. Identity Protection Management Services. Learn more. Prescription discounts, roadside assistance, Kid Secure ID Kit, and more. Learn more. 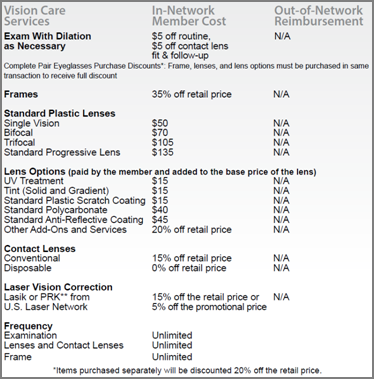 Savings on prescriptions, diabetic supplements, vision and hearing care, and more. Learn more. IDENTITY SERVICES™ from Identity Theft 911 gives you unlimited, one-on-one access to a highly experienced fraud specialist who will help you safeguard your personal information from identity theft. And if you are a victim of identity theft, your specialist will be there to act as your personal advocate and work with you to resolve any issues. The Pharmacy discount program helps you pay 15% to 31*% (on average) less for both generic and brand name prescriptions. You can choose the convenience of home delivery or pick up your medications at a retail pharmacy. * Average savings does not guarantee local market pricing, savings or availability at time of purchase. ** Average savings are based on a 30-day supply of frequently-purchased prescriptions nationwide, as averaged over a 6-month reporting period from September 2011 – February 2012. HealthFitLabs is dedicated to creating a healthy you in all areas of your life. HealthFitLabs is an online company that sells top-of-the-line natural vitamins, nutritional supplements, and bath and personal care products at discounted prices. Members receive 15% off. You receive 15% off at checkout. Healthy lifestyle products include from amino acids to herbs, and antioxidants to bee products, get what you need with a click of a button. Vitamin & mineral products designed to help you feel better physically, feel sharper mentally and combat the effects of stress. From Vitamins A & D to Vitamin B-12, vitamins and minerals can help you achieve optimal health. Pamper yourself with bath and personal care products—from the finest soaps and facial cleansers to natural deodorants and the ultimate firming body lotion. Shop for natural and organic immune system boosters for your pets as well. When you have a flat tire, dead battery or you lock your keys in the car, you need help. As a member of this program, you simply call a toll-free number anytime day or night and an experienced service technician will be sent out to help get you back on the road. You can call for roadside assistance 24/7/365 from anywhere in the United States and Canada. A qualified service technician will be immediately dispatched to your location. Services include towing, jump start, flat tire change, lock-out assistance, fuel/fluid delivery and winching. You are covered up to a maximum of $100.00 per incident and a maximum of three incidents per year. Teladoc connects you 24/7/365 to a national network of board certified doctors who average 15 years’ experience. Within approximately 30 minutes, a doctor will call you back ready to listen and help to resolve your issue. If medically necessary, a prescription will be sent to your pharmacy of choice. It’s health care that fits in the palm of your hand. Consults are at no cost to you. TELADOC IS NOT appropriate as a substitute for the regular care from your doctor or if you have a serious medical emergency. In the event of a life threatening emergency, dial 911 or go to the nearest hospital. © 2015 Teladoc, Inc. All rights reserved. Teladoc and the Teladoc logo are registered trademarks of Teladoc, Inc. and may not be used without written permission. Teladoc does not replace the primary care physician. Teladoc does not guarantee that a prescription will be written. Teladoc operates subject to state regulation and may not be available in certain states. Teladoc does not prescribe DEA controlled substances, nontherapeutic drugs and certain other drugs which may be harmful because of their potential for abuse. Teladoc physicians reserve the right to deny care for potential misuse of services. Teladoc phone consultations are available 24 hours, 7 days a week while video consultations are available during the hours of 7am to 9pm, 7 days a week. To help you find the right health club for you, your membership offers a one-week free trial (or one introductory session) at each facility you want to try out. When you have decided on a health club or exercise center to join, you are eligible for a discounted membership rate. The health benefits of chiropractic care, massage and acupuncture are well-documented. This discount program offers 25% off the usual and customary fees for services from a national network of over 19,000 participating providers, plus healthy discounts on health and wellness products purchased online. You and you immediate family save 25% on services from participating chiropractors, massage therapists and acupuncturists. Membership includes access to a health and wellness online store with discounts ranging from 15% to 40% on most items. There is no limit to the number of visits and services are not required to be medically necessary. Preventive and maintenance care from participating providers is also covered. With TicketsAtWork, keeping everyone entertained just got more affordable. Your membership includes valuable discounts on amusement parks, movies, sporting events, attractions and shows nationwide. Plus savings on movie tickets and other events closer to home. Discounts and special access to theme parks and attractions including: the Walt Disney World® Resort, Universal Studios®, Las Vegas and New York City shows and performances, Disneyland®, SeaWorld®, Six Flags, and Cirque du Soleil. Savings on car rental, hotels, tours and attractions across the U.S. Discounts on movie tickets, sporting events, and other special events. Dining & Food: Save on fast food, casual dining, and fine dining at over 70,000* participating restaurants. Entertainment & Recreation: Members enjoy savings at sporting events, amusement parks, and more. Services: Save up to 50% on services, including cell phone and internet, satellite television, cleaning, moving and more. Shopping: Enjoy online savings at more than 30,000 retailers. Additional savings on car rental, condos & resorts, cruises, health & beauty, home & garden, movies and more. It’s hard to think about. But if a child goes missing, having a detailed description, current photo and fingerprint immediately available can give authorities the vital information they need to spring into action. Each kit includes 4 cards to record the child’s information and picture, an ink pad to thumbprint the child, and four protective, self-laminating cards. It is recommended that parents keep one card in their wallet, one in the child’s backpack or diaper bag, and others given to anyone who cares for your child. Whether you have worn hearing aids before or you are new to the process, Connect Hearing can get you on the path to better hearing. From scheduling a free hearing test to choosing and maintaining your hearing aids, we’re with you every step of the way. Member save 40% to 60% on most diabetic supplies. Your program provides discounted prices on packages of diabetic supplies including monitor, lancets, test strips & carrying case. Benefits are available to both members and their immediate family members. There are no health restrictions and no limit on how many times you can use this service, as long as your membership is active. This program gives you easy access to a patient advocate who can help you deal with hospitals, ancillary facilities and other medical providers, including billing issues. Our patient advocates are highly-trained administrative experts who will be there to help when you need them. Advocates save you time and money by negotiating lower prices or payment schedules on hospital, doctor and other medical bills. Advocates help you find a medical specialist, critical illness provider or medical institution and coordinate the transfer of your medical records. Advocates help you solve complicated billing and other health-related administrative issues. Advocates understand your community and can help you find community resources. This program offers you and your eligible family members no-cost and affordable legal assistance from attorneys in your area. You will also be able to access our online legal and financial resources, including forms and information on a variety of legal issues. You and your eligible family members are entitled to one (1) initial 60-minute office or telephone consultation per separate legal matter at no cost. Each 60-minute session may be used to obtain an assessment of your legal matter, receive advice, guidance and to gain an understanding of the options that may be available to you under the applicable laws. There are no limits to the number of legal matters eligible for an initial 60-minute consultation. 900+ legal and financial-related forms. A library of helpful information on several thousand legal and financial topics. Attorney-written articles addressing relevant legal issues. Answers to frequently-asked questions that can help you understand legal issues affecting you and your family. More than 45 different financial calculators covering loan and lease payments, retirement objectives, educational funding requirements, and many other financial transactions. Assistance with a residential real estate closing. Preparation of a Will with Simple Minor’s Trust. Developing and assisting with funding a Revocable Living Trust. Life-threatening emergencies can happen anytime. MyDirectives is an online service that allows you to create and update a record of your personal medical decisions regarding critical or end-of-life care. This Universal Advance Digital Directive™ (uADD) can relieve your family of a difficult burden, by letting you decide ahead of time what types of medical care you do – and don’t – want to receive. Creating an online record makes this information immediately available to your doctor and family. Helps care-givers make medical treatment decisions that are consistent with your values, beliefs and preferences.